bx_cleansweep v2, Software Filter from Brainworx. Brainworx's BX Cleansweep V2 plug-in is a high pass/low pass equalizer, designed for getting out unwanted frequencies right off the bat. Digital audio is great at picking up the very low and very high end frequencies of a sound that you might not want in there, which is exactly where the BX Cleansweep V2 comes into play. All it is is a simple two band equalizer for high and low pass filtering, but it's great at what it does. I didn't have a problem at all with the installation of this plug-in as it was quick, easy and pain free. Learning how to use the plug-in was the same, as it's simple and to the point. It's got a graph that shows you the equalization that is being done, along with parameters to set the frequency for high and low pass and the level of each as well. There is also a phase button and an input gain knob to work with. It also gives you four banks to save your settings, so you can easily toggle through each one. At this point I've saved a few different settings and will use them as starting points depending on what I'd like to do with it. No manual should be necessary, but I personally haven't seen one for this plug-in. 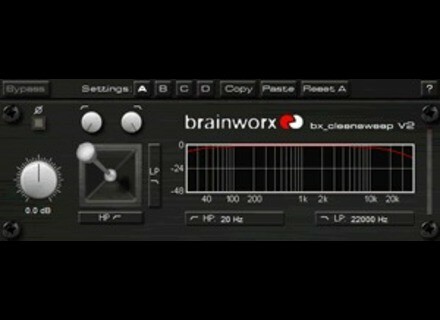 I'm running the Brainworx BX Cleansweep V2 plug-in on my home system currently, which is Pro Tools LE based. I run the software on a Mac Book Pro that has a 2.2 Ghz Intel Core 2 Duo processor and 4 GB of RAM. I'm running Pro Tools LE 8 with a Digi 002R audio interface or a Digidesign Micro Box if I'm on the go. This plug-in doesn't seem to take up much processing power at all, as I've been able to run many of them at once without hindering my system's performance.